The Witch basically has four possibilities. Either she sees a card from Team Village and either gives it to herself or someone else or she sees a card from Team Werewolf and give it to herself or someone else. If the Alpha Wolf is in the game it is advantageous to always look at the middle Werewolf card to immediately determine if the Alpha Wolf is in the game or not. If that card is a Werewolf, a good strategy can be giving it yourself and then playing as a Werewolf without any else knowing. If that card is not a Werewolf then note who it is and swap it with anybody. When someone claims to have the role that you saw, you know that the Alpha Wolf made them a Werewolf, which you can reveal or conceal as you see fit. Being on the receiving end of this strategy from the Witch is one of the surest paths to being lynched, i.e. the Witch says they picked up the middle Werewolf card and gave it to you. You can counter this by saying you were the Alpha Wolf, and you made them the Werewolf. When they, as the Witch looked at the center Werewolf card, saw it was actually the Witch card, realized what happened and panicked, they then switched it with your card. So now they have the Werewolf card, you have the Witch card and the Alpha Wolf card has now been moved to the center. This counter-claim will need to be swift and convincing. Unfortunately it can be countered by a Seer seeing the Alpha Wolf card in the center. Regardless of who I swapped I always like to say I looked at one of the Village Team cards in the middle and swapped it with someone else whom I didn’t. If that person was originally on Team Wolf and believes me then he may out himself as originally being a Wolf. This can lead to either another Wolf being implicated or a Paranormal Investigator if they looked at that person’s card or even the Minion being outed if another player was defending the first player up to that point. Witch is one of the most powerful town roles in the game. You can grab a card and assign a town role to someone, potentially turning a WW to an ally or grab a WW role (potentially even the Alpha Wolf’s WW card, though that’s maybe a bad idea) and give it to someone or keep it secretly yourself. Probably one of the quicker games I’ve played involved a Witch finding a WW card, giving it to someone else, and then waking up revealed as a Witch by the revealer. That was a pretty easy decision for town to make. Thanks for this awesome guide btw! So “yes”, if she wants she can take over that role. 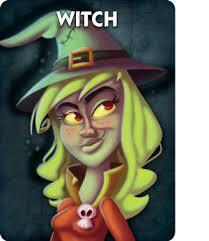 The Witch does NOT take the action of a card she turns herself into, as she has already preformed a role that night. Am I right in saying that the witch is over powered? I mean if she sees a werewolf, she can either give it to herself and claim that she gave it to someone else or she could truly give it to someone and out them immediately. Am I missing something or is she really that powerful? The Witch loses power in the amount of cards involved in the switch. She can be discredited (wether truthfully or not) by someone else claiming her card, claiming she isn’t that card, claiming the card she saw in the middle, claiming the card she moved something else, or claiming their role was never switched. She has lots of power, but it makes her easily distrusted.